T. J. Copping Ltd Roofing Specialists can repair or replace all manner of roofing materials in or around the London area. It may be that your roof needs a single slate tile replacing or fixing back in place, or a full roof replacement, either way we have the expertise to resolve your roofing issues. T. J. Copping Ltd Roofing Specialists are able to make the most of any roofing material, using natural slate, Welsh slate or Spanish slate. With more and more of our customers being environmentally conscious, we are frequently asked to fit or replace roofs with second hand reclaimed slate and synthetic man made slate. Why people in London want slate roofs! Unless you have chosen a synthetic slat roofing material of course, actual slate is a natural stone material. There has always been something rather special about any material that occurs naturally in nature and slate is no exception. Slate has beautiful colours and tones running through it and will also last for many years no matter what the weather throws at it. Slate roofing is durable and will keep the rain out, it will also absorb heat in the summer and insulate in the winter. Below are just some of the reasons why London housing developers, builders and homeowners choose slate roofing tiles as the go too roofing material. 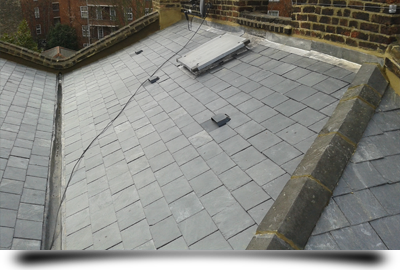 Being a natural product, slate can easily last for well over a century if cared for properly, therefore it comes as no surprise that it is such a highly prized roofing medium. A huge amount of waste generated by the building industry comes from roofing materials, so much so that it accounts for more than five percent of the total waste generated every year by building sites. This waste has to go somewhere and that will often be into landfill sites dotted around the country. Most of this waste will be the sort of building materials that only have a limited life span such as asphalt roofing, this can be as little as twenty years. When slate roofing is no longer fit for its roofing purpose, it can be busted up and used for other purposes around the garden such as a decorative topping for soil in borders, as it will be naturally weather worn and help to retain moisture in the soil. Slate does not burn! This fact alone makes slate a perfect choice for roofing material. One of the biggest fears for homeowners is the risk to their property from fire damage, this fear increases around November when people set off fireworks in their back gardens to celebrate the 5th of November. A stray rocket landing on a roof that is clad in natural slate poses no risk whatsoever. As already mentioned, slate can literally last more than a lifetime and as long as the construction is carried out correctly, 150 years is not far off the mark for the expected lifespan of a roof. When you consider how long other roofing materials last for, it is not really that surprising that people opt for a roofing material with such a long life span. The aesthetic appeal of natural slate could well be the primary reason why people choose it as the material they want for their roofs. Slate tiles are available in many different sizes and thicknesses, as well as a very wide range of colours, including grey, green, purple, black, red, and even a lovely mottled tile that has several colours running through it. The slates have been broken or have been damaged in some way. The flashings that surround the slate have themselves degraded over time. Like any job, it's always best to get a competent professional who has the necessary ability, knowledge, and skill to do the job successfully. This sentiment is particularly important when it comes to repairing or replacing a slate roof. If the job is not carried out correctly will only lead to further damage occuring in the future, costing you far more than the initial repair. A professional roofer will be able to determine what the underlying problem is and rectify it quickly and safely. Although reparing or replacing slate roof tiles may look like a simple DIY task, there is a lot more to it than meets the eye. First of all, there is the safety issue of crawling around at height and often on a sloped roof, secondly, is the roof structure safe to take your weight? These issues and more will be no problem for a professional roofer. Of course, it's not just the slate roof tiles that may need repairing or replacing, the flashings may need attention too. When flashings do wear out, they have to be replaced. This involves removing any slate tiles that are covering the flashings, removing the old flashings down to the bare roof deck, then replacing the flashings with new metal. Once this has been done you can start to replace the original slates back into their original positions. This is all routine work for professional slate roofers and not a job for the amateur DIY enthusiast.